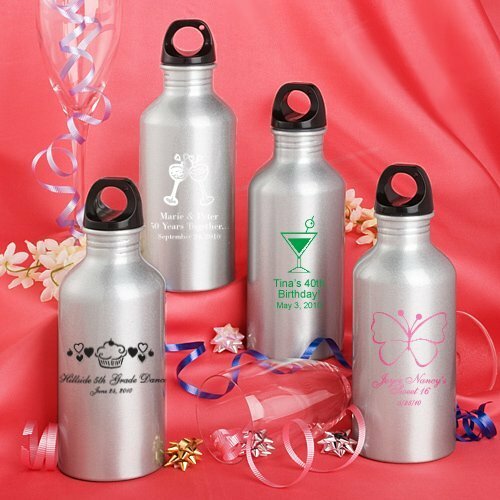 Celebrate in style with these unique water bottle favors! Personalized with the design, color option and text of your choice, each silver metal bottle stands 7 1/4" high by 2 1/2" in diameter and can hold 400 ml (13.53 ounces) of liquid. Each bottle has a black screw on top that forms a leak proof seal, with a hole in the cover for a carabiner clip or key chain. The bottles have a metallic finish and arrive bulk packaged in poly bags.Note: Please use our designer to see a preview of how your personalization will appear on the product.Note: For sample orders, you will not be able to specify personalization. Your item will consist of a random representative sample. I want to get these as gifts for my guests for my Mom 75th Birthday, if I ordered today would I get them this month? I need them before April please. Delivery dates are calculated by processing time and the destination zip code/address. Delivery dates will be provided to you once the item is added to your cart. Or, you can use the "Delivery Times" tab in the lower part of the product page. I'm sorry that's not possible as it takes at least 2 weeks to process and deliver this item. I just want them plain then, how do i check out with no personalization? You can leave a note on check out saying blank or do not personalize then reply to your order confirmation letting us know that you want it blank so we can update your order. I want to order the bottles but i want to put the each person names on it is it possible? Unfortunately because we make each one by hand and have to set the printing machine each time, we can’t do it one-by-one. I'm trying to customize the water bottle sand I want to know the font size. The font is only available in the options listed: Arial, Avenida, Block, etc. You can see a preview of how each option would look on your bottle. Unfortunately, we can't change the size from what's shown on the Personalized Birthday Themed Water Bottles. Do these water bottles come in gift boxes or something? The Personalized Birthday Themed Water Bottles will arrive bulk packaged in poly bags. I am looking to order 30-50 bottles personalized with happy birthday & cartoon theme (holly & ben). How much is the cost per bottle? Also what exactly is the material? 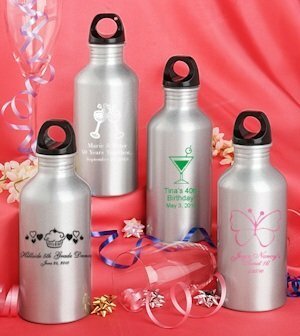 The Personalized Birthday Themed Water Bottles is a silver metal bottle. Also, only the design options listed on our site are available. You can add a text and select the design from our designer tool after adding it to your cart. The price would depend on the quantity you will purchase plus there's a $45 artwork setup charge.